Thomas Keyes was lead artist for last year’s SANCTUM issue of Dark Mountain, a special issue on ‘the sacred’. 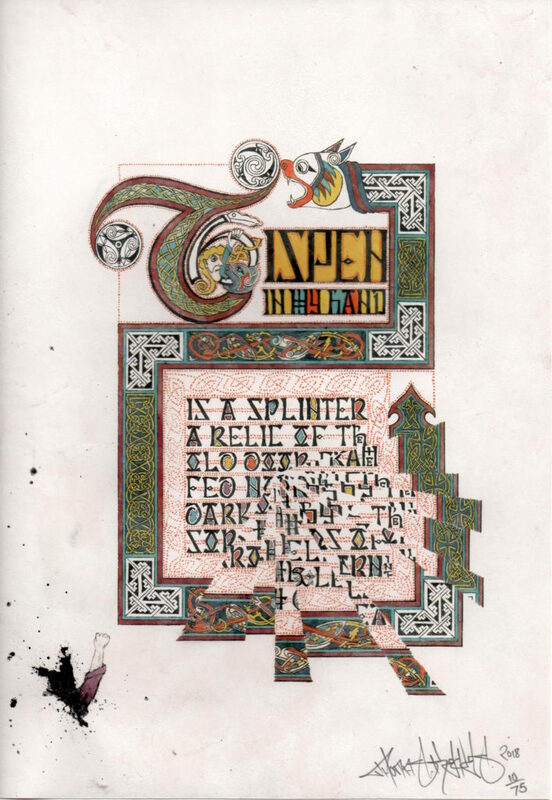 He brought together a team of artists, a cross between a graffiti crew and a monastic scriptorium, to create a stunning series of ‘incipit’ pages for that book. Today, we launch a limited edition series of prints on real parchment, made by Thomas – so if you loved the SANCTUM artwork, this is your chance to own a unique version. 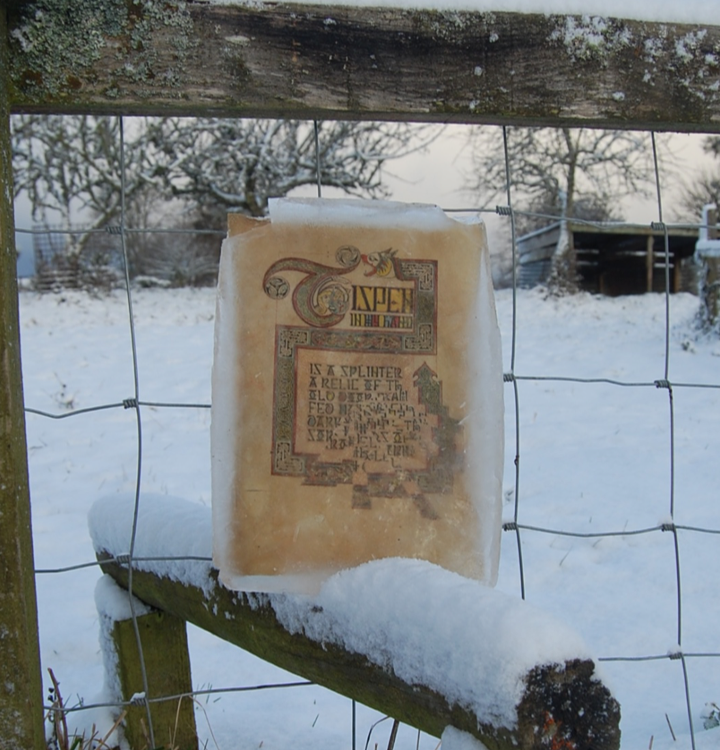 Meanwhile, in this post, Thomas tells the eventful story of how this new printing method came about. Thomas Keyes is an artist, forager and gardener. 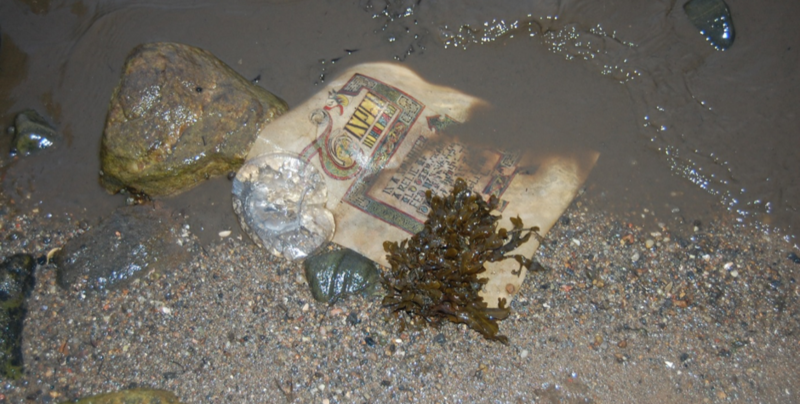 Specialising as a graffiti writer, parchmenter and manuscript illuminator with the intent of using each art form in its natural habitat with traditional techniques. He is art editor and lead artist for Issue 12 of Dark Mountain. The Dark Mountain editors may be getting to work on to Issue 15 – but I’m still working through Issue 12, SANCTUM, that special issue on ‘the sacred’. Twelve months after its publication, I’m not even a fraction of the way through all the notes, conversations and possibilities that opened up along the way. But today, I’m very happy to launch one of the tangible results of all this activity: a new print, a new printing method and – I hope – a new way for Dark Mountain to support the work of the artists that support it. The printing takes place locally to me at Alder Arts in Beaully in the Scottish Highlands where they have a fortuitous combination of expertise which includes creating fine art prints on a state-of-the-art ink jet printer and experience in handling parchment as fine art restorers. The innovation is to combine these two activities – and that has involved a drawn-out period of experimentation on my part to create parchment that behaves correctly in an ink jet printer. The combination of these multiple rounds of experimentation and Laurence’s keen eye for the quality of the image meant that it took some time and a lot of parchment to get it right. But now we have got there. Given that Dark Mountain takes as its starting point a scepticism about the long-term survival of this civilisation, it would feel a little hollow to offer prints on acid-free ‘archival’ quality paper. These prints are made on the skins of roe deer that lived in the Scottish Highlands: they are adult animals, so this is parchment rather than vellum, thick cut from the strongest sections of skin, with spine and rump, no flank. They have been processed outdoors using techniques which have changed little since the 7th century. Since the publication of SANCTUM, I’ve come into contact with Trinity College Dublin, the home of many of the most famous books in the insular tradition – and as a result of that connection, samples of these exact skins are now held in their collection. 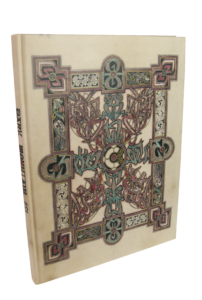 So for some of these prints, it can be said that the other part of the same skin from which the parchment of your print was made is sitting in the same collection as the Book of Kells. All of the skins used in these prints would have ended up in landfill or gone for incineration. There is no market for these hides and many more are currently wasted than could ever be used by small scale craft producers such as myself. I have not done a ‘carbon calculation’, and I’m suspicious of the methodology, but this does appear to be one of those rare cases where making more of these is actually better for the environment. Even the waste products of parchment making, hair and lime water, are exactly what the soil round here needs in terms of slow release nitrates and neutralisation of acids. The lime mainly comes from B&Q at the moment, so that’s not exactly perfect, but I have been supplementing it with lime I have produced in a sod kiln from shells recovered from an abandoned oyster farm. I am also reducing lime dependence through changing technique to a putrefaction system, so less than one 20kg bag of lime will be used for this entire print run. From animal to print, the distance travelled is no more than thirty miles and often quite a lot less. The original Insular manuscripts have been thoroughly tested. They are all over a thousand years old, many have the scars to back up the stories of their experiences, yet they are for the most part in a remarkable state of preservation with pigments that could have been painted yesterday and parchment that still behaves as the original creators intended. 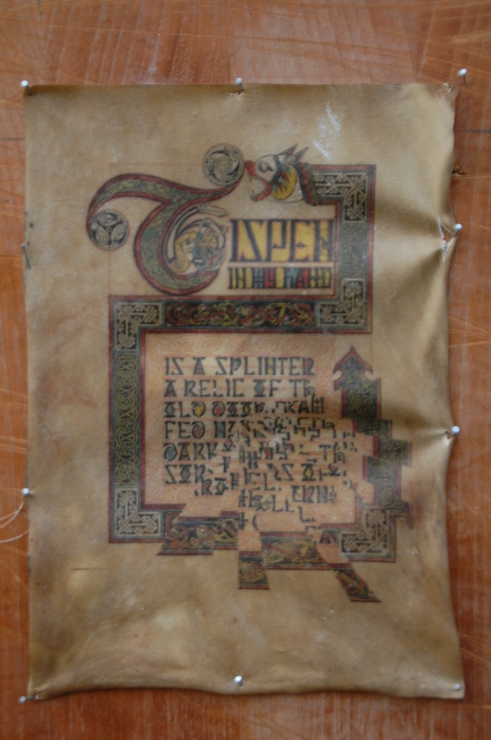 Many stories of miraculous feats have gathered around these manuscripts, stories that are usually dismissed as myths: the Lindesfarne Gospels were lost overboard on a sea voyage, then washed up undamaged; the Book of Durrow was soaked for the water to be used to cure sick cattle. In short, the books get wet and get left outside for a long time, but endure this treatment and come out of it functional. Well, I’ve come to believe that these books were deliberately put in harm’s way in order to demonstrate their power. It may have been an act of faith, or just good advertising, but either way it works and I have developed a testing regime for these prints based on the trials of the original manuscripts. 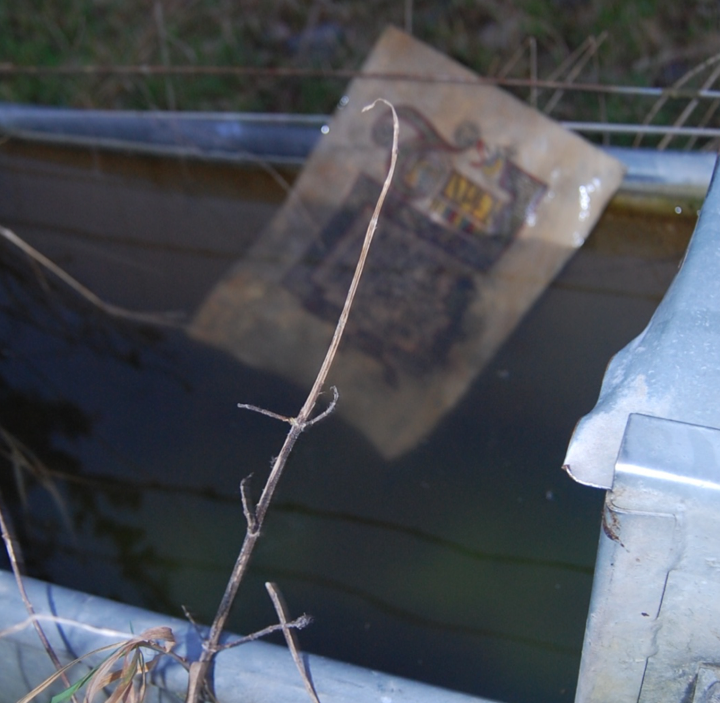 One print was put through all of these ordeals, before being pinned down and dried out. This is that print. Of course, these prints can also be framed and put on the wall without the above tests, in which case I reckon they ought to hold up pretty well for a millennium or so. Though not without its difficulties, the direction of travel for the practical element of this enterprise has been fairly straightforward. The design is based on geometry, the letters are inherited from a long scribal tradition where all the difficult decisions have been made and refined over generations – and even the essay which this incipit was created to introduce is itself grafted onto the deep roots of medieval Icelandic tradition. I’ve borrowed from scribes I can name such as Eadfrith of Lindesfarne and he himself built on the inheritance from others. I am one of nine living artists who have a stake in this enterprise – the team which came together to illuminate the SANCTUM book – and given the depth of the roots of tradition into which this piece aims to reach, I can’t even claim a majority share within my own mind. I am carrying a culture, so many of whose contributors can no longer choose a direction when a fork in the road appears – and this makes the next element of the process all the more difficult. I’m about to have a coffee break. But something in me gets it. I remember being in Bangor on the site of the monastery, more than 1400 years after Columbanus’s departure in 583 at the age of 40. I was 15, had no idea there had been a monastery and was exhausted after a 10 mile hike carrying coal sacks of paint through the middle of the night along the tracks from the monastic-satellite-turned-Belfast-suburb of Holywood, the trains usually being parked at Bangor overnight. They weren’t there that night, I got about two hours sleep, and I wasn’t put off graffiti one bit. The repetitive strain of using the spraycan for those years, since replaced by the fleshing knife of the parchmenter, has led to a deformation on my right hand which recently progressed to the point that I went to the doctor’s about it. I usually go about in a conscious search for connection to my teachers from the age of saints and scholars, but in this NHS waiting room, I didn’t even bring my notebook. I was there as a 21st century consumer of medicine: nature was causing me a problem and I wanted rid of it. The doctor was an expert in the field and gave me a diagnosis in about 30 seconds. It’s a genetic condition called Dupuytren’s contracture, it affects mainly males of Celtic and Scandinavian origin and is particularly common in the area of Scotland I live in and the area of Ireland I’m from. Symptoms don’t usually begin until well into middle age and only become severe in quite elderly people. I’m 33 and I can’t flatten my hand out. This led to a series of questions about any underlying issues that could be exacerbating the problem. Was I diabetic, epileptic? No. Alcoholic? Not quite. Were my family badly affected? No. In a broader sweep of the historical sufferers of the condition, just after being a MacCrimmon clan piper, he mentioned medieval monks as a demographic that were known to have had it particularly badly. The condition progresses to the point where the ring finger and little finger are curled over completely into the palm, leaving only the middle finger and index finger able to fully extend: this gesture is of course the sign of benediction associated with St. Peter and continued by Popes today. For monks’ labours to have physically transformed their hands into this holy gesture must have been perceived as a divine act. The more senior elderly members would have been more severely affected, no longer able to work with the larger tools of the parchmenter and gardener, confined to scribal duties and study. My fingers are curled in at 20 degrees, these days when it gets to 40 degrees I can get an operation on the NHS to get rid of it, albeit temporarily. But in the context of this journey, it isn’t an illness: it’s a sign of being on a pathway and a physical demonstration that I’m only at the beginning. Mine looks more like something from star trek at the moment and it will be many more years of parchment making before it starts to look like the well earned gesture illustrated in many an Insular Illumination. Here end these few pieces, written imperfectly in Irish. Not that I could not have written them in the Roman language, but these stories are hardly intelligible even in Irish; had they, on the other hand, been told in Latin, one would have been not so much uncertain as at a loss to know what language one was reading and how it was to be pronounced, because of the great number of Irish names that have no established forms. Sometimes it seems they weren’t quite sure what to do, but they did it anyway, and we are all the better for it. There’s comfort in coming across a passage such as that. There will be a maximum of 75 of these prints created. They will each be signed by me as they are produced and I will add original marginalia to each print in my own oak gall ink with a touch of orcein purple, a lichen pigment used both in the original Insular gospel books and medieval Iceland. There is variability in tone and texture, each is unique and only shares its DNA with one or two others. Prints are priced at £125 and are available to order through the Dark Mountain website from today. The proceeds will be shared between the nine artists who contributed to the SANCTUM book. The Autumn 2017 edition is a special issue of essays and artwork on the theme of the sacred.